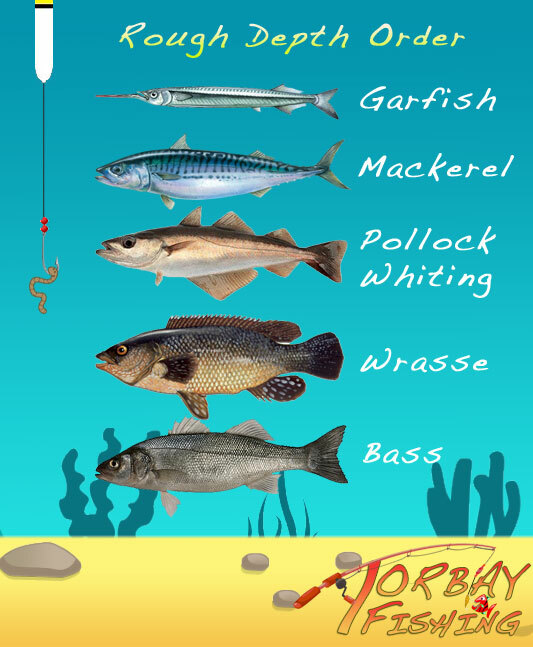 Here is a guide to the various methods and ways of catching mackerel. Mackerel are seasonal fish and usually arrive in our waters around late spring and leave early autumn. Saying that, this year (2016) they never really left. People have being catching mackerel all through this winter. You can easily find them around piers, harbours and jetties that provide easy access to deep water and tidal runs that mackerel favour. They tend to feed roughly half way up from the seabed. Pollock, whiting and mackerel all tend to hunt at roughly the same depth (half way up). Few people know this but when you unhook a mackerel to throw back please don't hold the sides of the mackerel to unhook them. All those scales on your hands or cloth are what the mackerel needs to control their tempreture and without those scales it will die within a day or two. Either jiggle the hook out while it is on the ground or try to hold it by the top and bottom of the mackerel to unhook it. You will be catching mackerel around the 1-2lb mark so you don't need a strong set-up but the more feathers you have on the line, the more stronger your rod and reel will need to be. If you're feathering with 3-6 feathers then put on something around a 15lb line on a fixed spool reel. I've used all sorts of rods for feathering and I switch between using 3,4,5 or 6 feathers depending on how capable the rod and reel is at holding the amount of fish on feathers. I initially use a 9ft spinning rod with 2-3 feathers on a fairly light reel. once I know the mackerel are about I'll switch to a stronger rod and reel and stick 5 or more feathers on it. I'll only need to use the heavier set-up a few times before I have all the bait I need plus dinner for the family that evening. The reason why I do this is that I find that my arms quickly start aching when I use the heavier gear. If I know I'll be feathering for a while I use the light gear first which allows me to feather for as long as I need. Once I know they are about I'll switch if I need to or just stick with a couple at a time. If you've never used a float before then you need to look at my "How to set-up for float fishing guide". Mackerel generally remain at the same depth which is between 8ft to 20ft. They also generally stay quite close to cliffs and walls. If you're fishing from a pier then you will probably only need to be casting out between 5 to 30 yards. I often see people on piers casting as far as they can but mackerel do tend to stick closer to the pier and cliff walls. 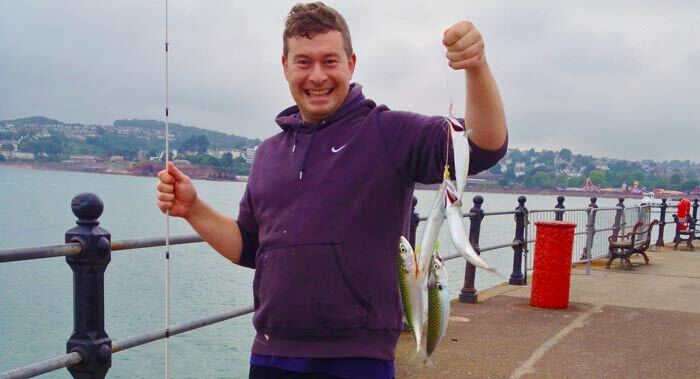 The best places to catch mackerel are piers and rocks, both of which are already in deeper water. Mackerel don't normally come in too close to the beach. This doesn't mean that they don't but as a general rule you'll get much better results if you're fishing away from the beach. The best baits are the shiny ones. The most common bait used to catch mackerel is mackerel themselves. Mackerel strips are excellent baits. You may also want to see my "Setting up a mackerel for bait" guide in the Beginner's guide section. Other baits used include garfish, scad, sand eels and squid. When a mackerel attacks bait on a float it's normally hard and fast. Your float will shoot down quickly and the vast majority of people will strike when the float goes under fast. If the float is only going a little under and then popping back up I'd wait a little to see what happens. 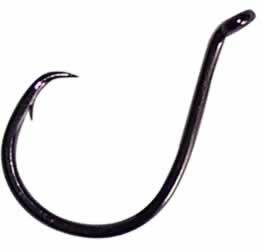 Because of the design, it is much harder for a fish to escape off of this type of hook compared to other types. I use circle hooks every time I float fish and the results are much better! 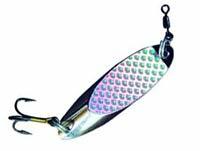 This lure has been around a long time and is a well established mackerel and bass lure. There are a few sizes but my advice is if you're fishing from the shore don't go too big. Even the smallest of dexter wedges can catch some mighty fish. Once you have a tight line after casting you simply pull the rod back in one continuous motion while keeping it at waist height. You then move the rod forward again whilst reeling in the slack. You then repeat. You will probably make 3 or 4 complete turns on the reel when you do this. You can also pull back the rod from ground level to above your head. The first way keeps the lure at pretty much the same depth while the down-up motion will raise the lure in the water. I prefer the first method but choose which suits you. Once you have a tight line after casting you keep the rod tip low down and give small gentle pulls on the rod while slowly reeling in the line. By small movements I mean around half an arms length at a time. This is a good method for lures with rattles. Once you've cast out and you've tightened the line keep the rod still and give the reel a few turns so the lure moves a couple of metres and then pause for a few seconds (4 to 8 is good). Then keep repeating this process. For all the above you need a light rod with a good amount of bend so every twitch you make travels down the line to the lure. Very short, light twitches mimic a fish in distress so the rod must able to carry that through to the lure. A light spinning rod is designed for exctly this so try to get a spinning rod if you enjoy using lures. The mackerel feathers are a complete rig. You will have a long line with each feather spaced about 30cm apart. You will either have a swivel either end or a loop either end. You will attach your main line (coming off your rod) to one end and a weight of your choosing on the other end. People ask me what are my favourite feathers. 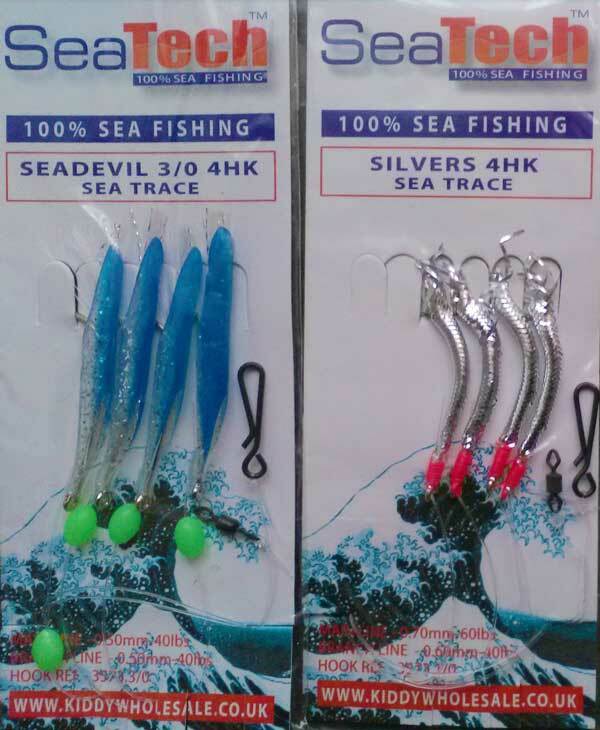 I love either of these; The SeaTech Hokkai red 3 hook trace feathers or the SeaTech sea devils 4 hook trace feather. I usually have many different types on me but these two are the ones I enjoy using the most and, for me, catch the most mackerel. If you have a light set-up then you shouldn't use more than 3 feathers. By light set up I mean if you're using equipment like a spinning rod, a very cheap rod and reel etc. You should only use the amount of feathers your gear can handle. A large beach caster with a strong multiplier or fixed spool reel will be able to handle the weight of 6 mackerel on the line. You will often see people casting their feathers as far as they can but often the mackerel aren't way out at sea but right below your feet. You can often catch them by just dropping the line into the sea below you and simply slowly raising and lowering your rod. Mackerel tend to not be at the bottom on the sea bed so let it drop to the bottom and then move it around half way up and then start raising and lowering your rod. Don't feather at night, the fish can't see the feathers in darkness! I'm amazed at how many times I've seen people feathering in total darkness and wondering why they can't catch anything. Also if the sea is really cloudy then the fish won't be able to see the feathers shimmer and shine in the water. Feathering is best when the sun is out and the water is pretty clear. When you cast out let the weight hit the seabed BEFORE you close the clasp and start feathering. To start you reel in the slack line until you can feel the weight and then stop reeling in further. Now you simply pull the rod back in one continuous motion from waist height to head height. You don't reel in the line while you're pulling the rod back so the only time you reel in the slack line is when your moving the rod back down the waist height. You will probably make 3 or 4 complete turns on the reel when you do this. There are other types of weights. Bombers are also good weights to use. They are smaller than these and they can also cast far. You will also need to attach the line to the top loop. The most common knot for this is probably the blood knot. When mackerel are about in numbers in isn't uncommon to reel in a mackerel on every feather. Remember, if feathering on a pier or breakwater just drop the feathers directly below you and stand there jigging them up and down. You would not believe the amount of times I've left the pier with a bucket full of mackerel for a family BBQ and no-one else had any simply because this was what I was doing. On really light gear mackerel put on a real fight. When I feel in the mood I will go down my local pier with a cheap and nasty telescopic 8ft rod. I use a reel I bought for a tenner and I have a 2lb line on the reel and I cast out a float. With this kind of set up what used to take a few seconds to reel in becomes a 5 to 15 minute fight as you battle to bring it in. I really do recommend doing this when you can, it's great fun!